The Sorbus Double Hammocks comes in a stylish and colorful design that will make it stand out in your backyard or anywhere else you might desire to use it. It consists of a striped bed and a sturdy steel stand that is weather resistant for maximum durability. The five adjustable height positions make it possible to choose your perfect relaxation spot. Sorbus makes it with a colorful and durable blend of cotton and polyester that will not rip or stretch under pressure. 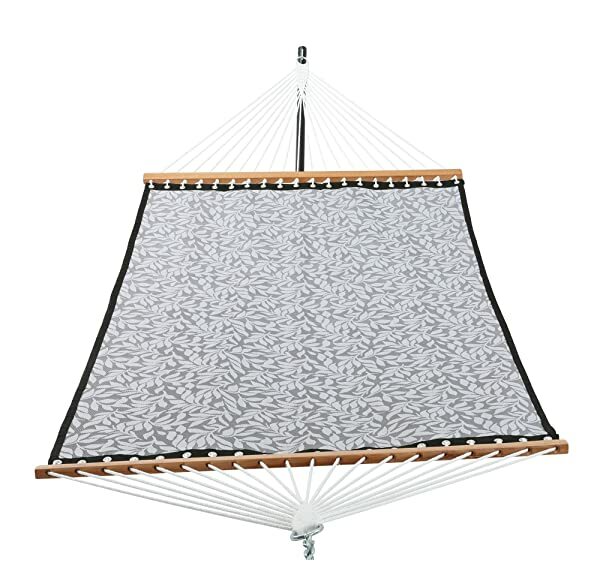 This hammock features a large hanging bed that you can use to relax your entire body. The stand is sturdy and weather-resistant steel. 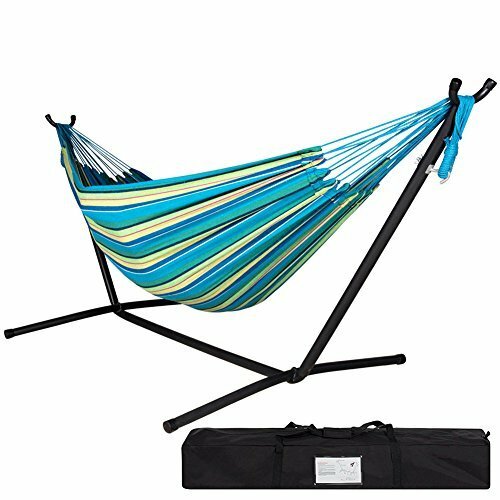 This hammock also comes with a carrying case for easy transportation and storage. It will hold up to 450 pounds, and it is spacious enough for two adults. You can set it up fast and without using any tools. It is quite a weighty hammock, and so it is not very portable. The bright colors tend to stain easily. The fabric is a little scratchy/rough. The Sorbus Double Hammocks comes in a stylish and colorful design that will make it stand out in your backyard or anywhere else you might desire to use it. It consists of a striped bed and a sturdy steel stand that is weather resistant for maximum durability. 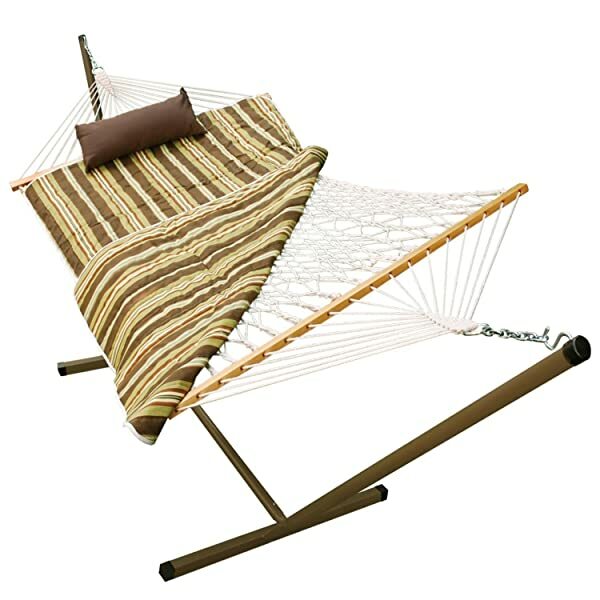 This hammock is spacious enough for use by two adults at the same time, and it can withstand up to 450 pounds. And to make it easy to store and carry the manufacturer also provides a durable carrying case. Material: Sorbus makes their stand with a powder coated steel material that is sturdy enough and weather resistant to ensure maximum durability. 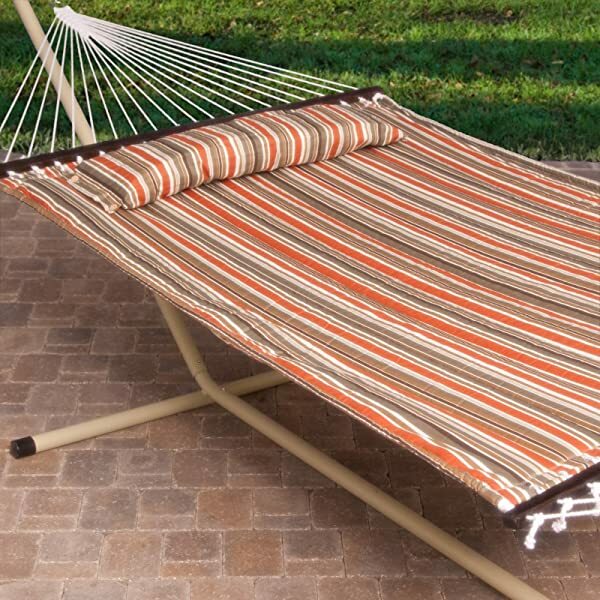 The hammock bed is a beautiful combination of a polyester fabric and cotton that will not rip or stretch under pressure. Dimensions: The bed dimensions are 86 inches (length) by 60 inches (width) while the stand is 110 by 48 by 44 inches once you set it up. Also, the stand has five adjustable height options that make it possible to choose your perfect relaxation position. And at a total weight of 29.8 pounds, it is quite weighty, but it is still possible to move it around. Weight Capacity: This best hammock has a weight capacity of 450 pounds which means that it can withstand the weight of two adults using it at the same time. Colors: This bed comes in a striped design, and you can choose from some beautiful color combinations of two or more shades. Extras: You will also get a convenient carrying case when you buy this Sorbus product, and so storage and transportation will be easier for you. 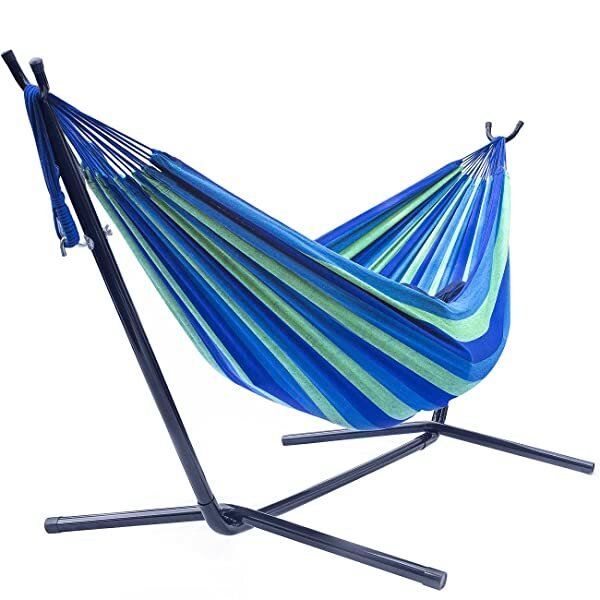 The manufacturer also includes all the hardware that you need to assemble and use this hammock. This stylish and colorful double hammock by Sorbus is designed for someone that wants to enjoy the outdoors but does not have a lot of pace or trees for hanging a hammock. The spacious bed can withstand a lot of weight, and it has enough room for two hence making it perfect for couples. The steel stand is also high quality and weather resistant to ensure that you get to use it for many years. Sorbus also provides a carrying case for this product to make transportation and storage easier for users. And even with the few shortcomings such as the weight, this is still a top notch product that is worth the investment.